Gas operation is usually the motive force for revolver cannon. The first practical example of these was invented in Germany towards the end of the Second World War by Anton Politzer of Mauser, who were seeking to improve the rate of fire of aircraft cannon. The main limiting factor was the length of time it took for the fired case to be removed and a fresh cartridge inserted into the chamber. Politzer conceived the idea of achieving this movement in several stages rather than all at once, thereby effectively slowing down the process without slowing the rate of fire. He did this by designing a rotating cylinder, with its axis parallel to the barrel, which contains several chambers, just like a giant revolver handgun. With each shot, the cylinder is rotated to move the next chamber in line with the barrel. As it rotates, so the fired case is extracted and a live round loaded, in gradual stages - how gradual depending on the number of chambers, originally five but varying between four and seven in current weapons. The original design provided for blowback extraction, but this was soon replaced by mechanical means. An obvious problem is the loss of propellant gas through the gap between the cylinder and the barrel. This is usually overcome by fitting each chamber with a sliding sleeve which bridges the gap at the instant of firing, forming a gas-tight seal, or by pressing the cylinder against the rear of the barrel. A further alternative is to make the cylinder shorter than the cartridge, so that the cartridge case extends into the barrel, sealing the gap. Another difficulty is that unless the mechanism is externally driven (normally gun gas is used) there has to be some means of starting the process. Special pyrotechnic cartridges are often used to generate the gas to initiate the cycle. cartridge, resembling a stretched 30 X 113B but different in detail. The gun achieves a very high (2,500 rpm) rate of fire by using seven chambers. The Americans adopted the revolver principle soon after the war (in fact the idea was patented in 1905 by Charles Clarke of Philadelphia, but then forgotten), but unlike the British and French chose a 20 X 102 cartridge, later also used in their M61 rotary cannon. This led to the Pontiac M39, introduced in the early 1950s, which over thirty years later was improved to create the lightweight, faster-firing Ford Tigerclaws intended for the abortive Northrop F-20 Tigershark. Other calibres of revolver ranging up to 37mm were built but not adopted. The Swiss Oerlikon firm, another recipient of a Mauser engineer, developed a range of revolvers commencing with the 20mm 206 RK (Revolver Kanone), which used an electrically primed version of their new 20 X 128 cartridge, and the 30mm 302 RK. Other variants followed, perhaps the most unusual being the abortive 42mm 421 RK A A gun developed for the UK, which featured two barrels loaded from a single seven-chamber cylinder to achieve 450 rpm. This led to the 'Red Queen' weapon which was tested secretly in the early 1950s before being abandoned. 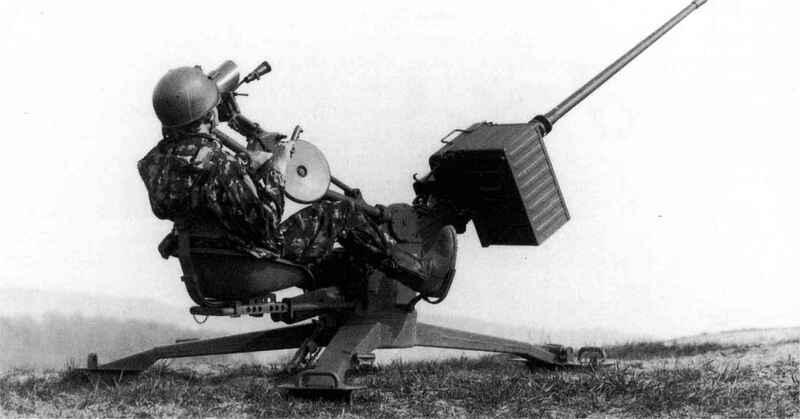 Later versions of the Oerlikon aircraft guns differed from the original Mauser design in using four rather than five chambers. However, none was adopted for service until the massive KCA (initially developed as the 304 RK), firing the powerful 30 X 173 cartridge, was selected by Sweden in the 1970s. The 304 RK was also chosen by the USA as a back-up in case of the failure of the GAU-8/A rotary cannon for the A-10 aircraft, slightly modified and dubbed GAU-9. In the mid-1990s Oerlikon-Contraves announced a scaled-up version of this gun: the 35mm 35/1,000. Mauser have appropriately reclaimed their invention in the five-chamber BK 27 aircraft gun, which fires their unique 27 X 145B cartridge. Incidentally, Mauser- Werke Oberndorf was acquired by Rheinmetall in 1995 but continues to exist within the larger group. Rheinmetall also took over Oerlikon-Contraves in 1999. An unusual revolver cannon was the American Mk 11 designed by Frank Marquardt, chambered for the 20 X 110 USN (Mk 100) cartridge. 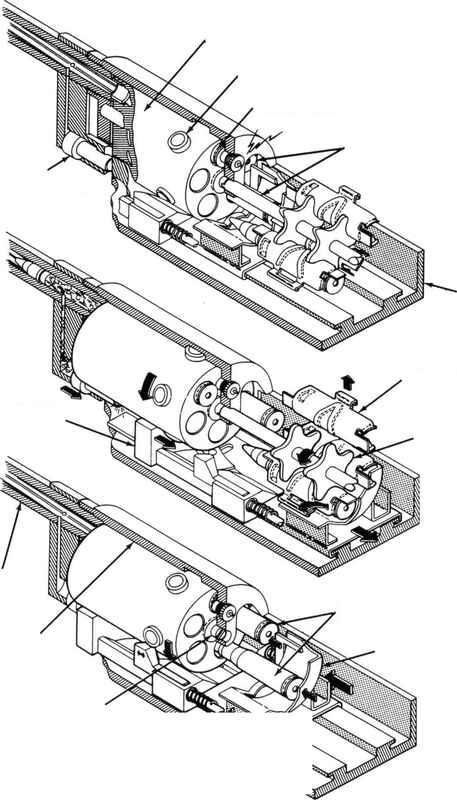 Like the Oerlikon 421 RK this featured two barrels, in this case fed by one eight-chamber revolver cylinder from two separate belts, with firing from both barrels simultaneously. The gun used both gas and recoil to power its operation. Prototype versions were even more peculiar as they used a unique ammunition feed system which enclosed the cartridges within linked 'projectors* (like large cartridge cases) from which the cartridges were fired into the chambers. Production versions used a more conventional belt feed. The Mk 11 was only ever used in the Mk 4 gun pod carried by various naval aircraft. power. This version still needs an electric motor to start firing (although a powerful spring was developed as an alternative), after which gun gas takes over. It was fitted to the SUU-23/A gun pod, which also carried 1,200 rounds of ammunition. How a revolver cannon works? How a revolver cylinder rotates? How does a revolver cannon work?